After months of training the senior men’s squad from Durham Amateur Rowing Club travelled to London hoping to compete at one of the most prestigious events in the rowing calendar – the Metropolitan Regatta. The Men’s Intermediate 2 8+ event took place on Dorney Lake in Eton, home of the rowing events at the Olympics games 2006 and will be the venue for the Olympics in 2012, on the eight lane, 2k stretch of water. This was the first time in many years that the senior crew has attempted to compete in the ‘Met’ for the 154 year old Metropolitan Challenge Cup. After a closely fought race against crews from Nottingham University and Jesus College Cambridge, Durham Amateur Rowing Club did not disappoint. 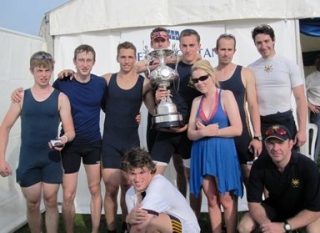 Winning the most coveted trophy by 0.012 of a second represents a massive step forward for the crew now with Henley qualifiers in their sights. Left to Right: James Dickinson, Matt Hunt, Alex Willen, Alex Higgs, John Roxborough, Mike Veldman, Becks Palmer (Tideway Scullers), Harry Sheperd, Danny McCarron and their coach Bill Pollard. This year at the 177th Durham Regatta, Durham Amateur rowing club entered 50 crews all racing for pots or assorted trophies which were presented on the final day of racing at the Town Hall. Being the most prestigious event in the north of England Durham Regatta attracts a high level of competition at both a national and international level. With competitors ranging from 13 to 65 Durham Amateur Rowing Club competed in a variety of different events. There were strong performances across all races ranging from singles right up to 8+’s with the inter-club rivalry as fierce as ever. DARC’s veteran men 8+ being in the age category of E which is ?? were racing a crew that were age category C entitling them to a head start. The DARC crew declined the head start and proceeded with a relatively easy win over their younger opponents before heading off to the National Veteran Championships in Nottingham the following day. By the end of racing on Sunday the club had managed 13 wins among them winning the Hild Bede Trophy in the coxed quad event and the T.S.B. Challenge Trophy in the coxed four. The participating crews were MJ18 8+ Calum Gibson, Gus Bonnington, Tom Carver, Stuart Lyons, Chris Tully, Darren Smith, Ben Reilly O’Donnell and cox Charlotte Meikle, MJ18 4+ Sturart Lyons, Chris Tully, Darren Smith, Ben Reilly O’Donnell and cox Charlotte Meikle, MJ18 2x Chris Tully, Ben Reilly O’Donnell, MJ16 4x Sam Kirby, Joe Dowdle, Jack Thomas and Harry Wallace, MJ15 4x George Adair, Jimmy Gibson, Alex Trotman, Anthony Thornton and cox Deborah van Zwanenberg, WJ16 2x Caitlin Hatton, Rachel Matthewson, WIM3 4+ Dorothy Polos, Alice Bryant, Anna Philips, Alice Ford-Senior and cox Shannon Kay, WJ13 4x+ Katie McDaid, Lauren McMillian, Francesca Whitfield, Sarah Preston and cox Georgia McMillian. The senior wins include MIM2 1x James Dickinson, W Open 2x Maddy McCarthy and Natalie Burgess, W Open 2x Megan McCarthy and Natalie Burgess, W Open 1x Maddy McCarthy, MIM3 4x+ Gary McCarthy and Peter Robinson, W Masters 4x- Megan Bell, Carolyn Edwards, Hazel Stainforth and Sam English, W Masters D 1x Gill Prescott and the M Masters 1x Andy Jaggard. The DARC senior men were rowing in the Elite 8+ beating DUBC 2nd crew and Agecroft to reach the Final. Only to be beaten by 1/3 of a length to DUBC’s first crew. Coached by Bill Pollard the DARC 8+ including Str Danny McCarron, Harry Sheperd, Matt Hunt, Alex Higgs, Alex Willen, Mike Veldman, James Dickinson, John Roxborough and cox Emma Watcham who are all hoping to make it to Henley this year. On the purpose built 2000K stretch of water used for training elite athletes, the National Water Sports Centre played host to the National Veteran Championships on the 13 June 2010. The 6 lane sports facility regularly hosts national and international rowing events along with canoe/kayak sprint competitions. Last year Durham Amateur Rowing Club entered 9 events at the water sports centre, bringing home 2 gold medals in the Women’s Veteran C intermediate 3 1x rowed by Gill Prescott and the Women’s intermediate 3 2x rowed by Gill Prescott and Helen McMillian. Durham Amateur Rowing Club put in seven entries this year. The entries included Gill Prescott entering the Masters D category in her single claiming gold by 0.08.3 of a second. The Veteran men entered the Masters E category in the 8+. The veteran men E 8+ consisted of Mickey Stevens, John Appleby, David Heppell, John Watkinson, Dave Walker, Martin Judson, Kim Metcalfe, Paul Stanley and Cox Emma Watcham narrowly missing 1st place by 0.6 seconds. The women entered as Masters B coxed 4+ being Becks Lippe, Toria Lloyd, Karen Warrior, Dajana Dzanovic and cox Ruth Barker who won gold medal by 0.01 seconds demonstrating the high standard at this event. Racing the Masters 8+ the women’s crew including Dajana Dzanovic at bow, Karen Warrior, Andrea Preston, Jane Scott, Judith West, Helen McDaid, Toria Lloyd, Becks Lippe and cox Ruth Barker took third place with 0.033 of a second between them and the winners Nottingham Rowing Club. Martin Tyler racing as Masters E category in his 1x pulled in third place 0.633 of a second slower than the winner. Four of the Veteran men out of the 8+ raced again in a different combination. The penultimate race of the day was the Masters F men’s coxed four which was won by John Appleby, Kim Metcalfe, Paul Stanley, Mickey Steven and cox Emma Watcham with Martin Judson and Dave Walker taking silver in the Masters E4+ with a Blue Star composite. This entry was posted in Racing News on June 29, 2010 by admin. Durham ARC Senior Men Win The Metropolitan Cup at Dorney Lake. The crews was as follows. The Senior men would like to thank their coaches Bill Pollard(pictured), Kim Metcalfe, Jed Gargan and Phill Tully. This entry was posted in Racing News on June 7, 2010 by admin.